Finding the right match or "mismatch" to complement your engagement ring will complete your wedding set and overall look. Many of our custom engagement rings are made specially for a flush fit with the wedding band while others allow for a small gap which looks beautiful as well. Either way, you have the freedom to choose something that exactly matches your engagement ring band in terms of setting style, metal color and thickness, or opt for a wedding band that contrasts in all features. Designing both rings at the same time makes it an all in one process, however waiting until closer to the wedding date creates a fun activity you can do together after the engagement. We recommend purchasing your wedding bands at least two months prior to your wedding date to ensure it will be ready in time. Below we are going to speak about options for those who want to wear their engagement ring and wedding band on the same hand. For a full tutorial video on wedding band options for engagement rings watch this video here. For people who love perfectly matching rings, it is sometimes a good idea to have both rings made at the same time. While a perfect match can also be made later by using your engagement ring, it does tend to make it easier to design both in accordance with each other at the same time. It also combines what would be two processes into one and takes less time, budget allowing. If you are one of our many remote clients, we recommend mailing us your ring (we provide you with an insured shipping label) so that we can ensure a perfect match. This option is becoming very common, which is to mix metal colors, or wear a band with a different shape or thickness than your engagement ring. It can add a unique touch to the overall look while tying together two different designs perfectly. In this instance, there are going to be many more designs and styles for you to choose from and trying them on side by side will help you visualize exactly how it will look. Again, if you are remote client, we can offer to send you photos of your ring design side by side with the wedding band options you have in mind so you can see precisely how it will look. Matching Delicate Band: When worn alone this band has a very delicate look overall and together it gives the rings the appearance of one thick band. For those that love a matching look and want to detract the least amount possible from their engagement ring, or stack several bands together, this is the best option. Keep in mind when worn alone, this band may not show as well as other because it is naturally delicate in width and appearance. Slightly Thicker Pave: The thickness is not overly noticeable and provides a nice contrast with your engagement ring. What we like about this option is that you can see the engagement ring and wedding band as separate entities. This band also looks very nice on its own should you choose to not wear your engagement ring every day. Thicker Pave: The diamonds here are impressively sized and it is easy to see each distinctive stone set into the band. We like these with our pave rings for a flashier look and these are incredible worn on their own. Our flat pave rings in thicker sizes give the big look of a classic large eternity band however the fact that they have a flat and smooth interior makes them extremely comfortable and can sit very close to your engagement ring. Because these bands are slightly thicker and have diamonds on all sides there are a few ideas to consider. First consider how you will be wearing your engagement ring set: Do you want to wear the engagement ring separate from the wedding band on different hands? Additionally, do you see yourself retiring your engagement ring from daily use after you get married and only wearing the wedding band? (Think about work, your daily life, etc.). And finally, will you always be wearing the engagement ring and wedding band together on the same hand at all times? Matching Three-Row Band: You can of course opt for something that looks like an exact match of your three-row engagement ring band which will give you a beautifully balanced look. Many assume that wearing a three-row wedding band side by side with another three-row ring will defeat the purpose of having sparkle show from all angles. While two sides may be partially blocked when worn together, the diamonds brilliance will still reflect off each other. This is a good option for someone who will wear the band on its own. Two-Row Band: You can opt to delete one row of diamonds from the outer perimeter engagement ring. By doing this, you can then also delete one row of diamonds from your multi row diamond wedding band. This way, you will have a total of four diamond rows (instead of 6) and the 2 center rows will sit next to each other and have no diamonds on them whatsoever. 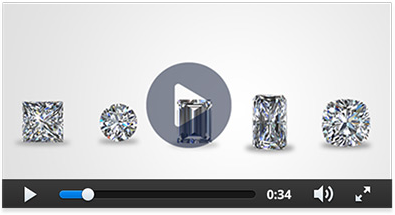 Check out this video, showing the two sided engagement ring paired with a two sided band. This option works best if you plan to always wear your engagement ring and wedding band together on the same hand at all times because having the extra edge of plain metal showing on either ring may not be aesthetically pleasing to all. Wide Single Row: You can also match your triple sided band engagement ring with a wedding band featuring a single row of diamonds down the center and aim to match it in terms of thickness. This type of ring will not add too much bulk to your engagement ring set and still allows your diamond setting to take center stage. This band will slide up right next to the engagement ring for a flush fit. For someone who is satisfied with the sparkle provided by their engagement ring and wants to keep the rest of the look understated, this is the perfect set up. The look and structure of most three-stone engagement rings do not traditionally lend themselves well for eternity bands, however at Lauren B we craft most of these styles of rings to sit flush with a wedding band. Three stone rings are a timeless and classic design that truly never go out of style and finding a wedding band to pair with it is no longer a concern. Thin Pave Band: By pairing a three stone ring with a pave band you are adding a modern and fun twist to your ring. These thinner bands also tend to sit nicely next to three stone rings that don't leave any gaps between them. We can custom create the pave band at any desired millimeter thickness to pair with your design. Bright Cut or Channel Band: Bright cut and channel set bands look similar in that they have a smooth edge of metal along the edges of the ring. This classic style complements the look and feel of a three stone ring. The metal edges on the band will perfectly complement the metal showing on the engagement ring. Match the Shapes: Depending on the shape of your center stone, we can create a custom wedding band with those diamond shapes to match, or something to contrast it. If you have an emerald cut or asscher cut three-stone ring, consider an emerald or asscher cut eternity band. If you have a round center diamond, consider round diamonds set in a basket setting or U-prong style design for a classic look. These types of bands give a bold look with a lot of sparkle. While they may not sit perfectly flush because of the higher profile setting needed for the eternity band, that should not be a drawback as the sparkle will overtake any space between the rings. If you want them to sit flush consider a smaller size eternity band in any shape you like. Bezel Set Band: For those that love a more vintage look, opt for a retro inspired bezel set eternity band where each diamond is encased in a thin rim of metal. As with the bright cut-channel example above, the metal on the edges and overall classic look will play in nicely with the metal of your traditional three-stone engagement ring.